Some Facebook users have been in an uproar over privacy controls in recent weeks. (CNN) -- Facebook has announced a new security feature that aims to keep hackers from tapping into users' personal information. The change comes amid rising concerns about privacy and security on the online social network, which has 400 million members worldwide. The new feature, announced Thursday, makes Facebook a bit more like an online banking site. Users can identify certain "approved" computers and mobile phones that are allowed to access their Facebook accounts. If an unauthorized device tries to log in, the user will be notified of that activity by e-mail or text message, allowing them, in theory, to shut down an attack before any information is stolen. In order to access a Facebook account from a new computer, or from a friend's phone, for example, users may have to answer a security question. Facebook says the feature is unique in the social networking world. "We're confident that these new tools and systems will do a lot to prevent unauthorized logins and the nuisance they can cause," Lev Popov, a Facebook software engineer, writes in a company blog post. "As always, though, the first line of defense is you. We need you to help by practicing safe behavior on Facebook and wherever you go online." 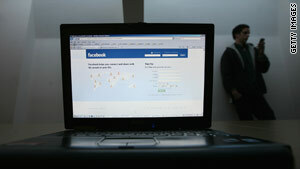 Video: Facebook privacy claims: True or false? Facebook users must choose to activate this change. To do so, log in to Facebook and click the "Account" button at the top right of the screen. From that menu, select "Account Settings." Scroll down to "Account Security" at the bottom of the page and click the link that says "change." The site asks: "Would you like to receive notifications for logins from new devices?" If you would like to receive such updates, then click the button by "yes." Some users have complained they are uneasy about their personal preferences showing up on sites other than Facebook.com. Recently, an unknown number of people, including some notable tech pundits, have deleted or deactivated their Facebook accounts in response to privacy concerns. Last month, a group of U.S. senators sent a letter to Facebook asking the company, which was started in a Harvard dorm room and is now valued at billions of dollars, to give users more control of their private information. The new security features do not address the issues most users have been complaining about, such as whether Facebook will keep their information private. Instead, the latest feature aims to protect Facebook users from external hackers. It does not change company policy. The online media this week jumped on news, confirmed by CNN content partner CNET, that Facebook called an "all-hands" meeting in response to the swell of concern over privacy issues. Facebook makes no mention of this meeting in its blog post, and it remains unclear whether Thursday's changes were a result of that meeting. Thursday's changes are drawing some skepticism online. Dan Nosowitz, a blogger at Fast Company, questioned whether Facebook should have made its new privacy setting active by default. "Oddly, this system is 'opt-in,' meaning by default it's not enabled. You have to dig through Facebook's labyrinthine privacy settings to turn it on," he writes. "This might be a mistake, given how complex and intimidating Facebook's privacy settings already are." On PC World's website, JR Raphael writes that the changes may not do much to ameliorate the concerns of angry Facebook users: "Facebook has just unveiled a new set of user controls, but it isn't likely to do much in the way of calming anger about the social network's privacy policies." Let us know what you think of the changes in the comments below. What do you think of Facebook's efforts to integrate into other websites? Do you feel secure when using the site?